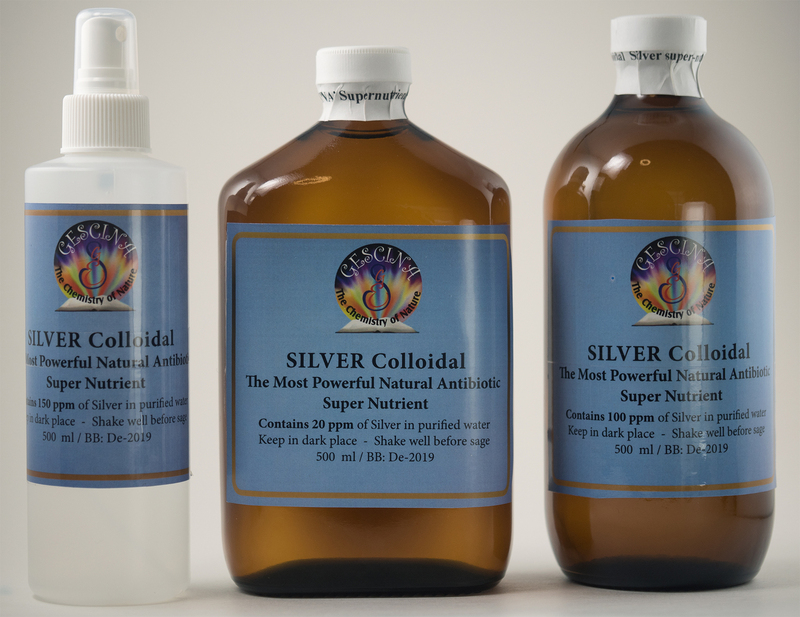 Colloidal Silver | Gescina The Chemistry of Nature Inc.
Colloidal Silver exists in Natural Spring Water, and is a safe and natural nutrient and a powerful defense “tool” against many diseases and infections. Recent study shows, that Silver is, in fact, the vital structural element of the human body. In addition, Silver activates chakras. Most of Silver is contained in brain, grey irises, the endocrine glands, liver, kidneys, skeletal bones and nucleus(nidus). It is revealed, Silver is much more then killer of pathogens, it promotes growing of bone mass, accelerates processes of regeneration of damaged fibers. In the presence of Silver, body itself regenerates fibers (Dr. Robert Becker, orthopedic Surgeon, USA). It acts as a catalyst in many chemical reactions of all organs, accelerating vitality and health of the whole body. Silver as Gold, Copper and Zinc, participate actively in the synthesis of vitamins, ferments and hormones in the body. A number of recent research studies show that Silver actively assists in the metabolic processes in the human body. It promotes oxygen absorption via brain tissues resulting in its improved functioning. Silver participates in the regulation of energy exchange in the body and it has been discovered that the stimulating impact Silver has to the formation of blood such as increasing lymphocytes, monocytes, erythrocytes and hemoglobin. Thus, Silver is today considered as a micro element necessary for the normal functioning of the internal body systems and organs. It is a powerful tool for immune-stimulation and as the widest spectrum antibiotic. 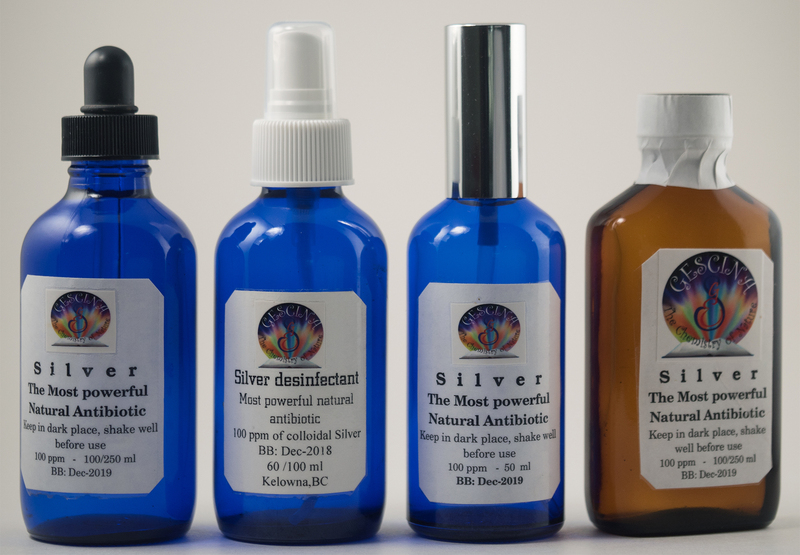 colloidal Silver is safe and doesn’t cause any negative consequences for children, adults and many living species. Clinical studies shown that at 0.01-0.05 mg/L, (equal to thousands of ppm) Silver colloidal is safe and considered as physiological amounts. Even during long periods drinking of high concentrations of Silver, it is accumulating in fibers, other organs, but this doesn’t cause any inflammations or destructive changes not dangerous, and “argyria” (2, p. 15). It is proven that external applications have had 90 times higher effect than Penicillin compounds[http://wwwh2oplanet.rushowentry.php]. including lotions, sprayers, creams, tinctures, serums, salves and rubbing liquids. [Great deal of developments done in 1940-1960 s in Russia [ Russian State Medical University, Scientific Center of regenerative medicine,). They developed quit a few skin-care cosmetic products with healing anti-aging and regenerative effects.]. Healing cosmetics with Silver is well-known area, the production exceeds tons globally. Silver water produces anti-aging, balancing effects on skin, especially for thin, sensitive and irritable skin. Silver eliminates dryness, seborrhea, improves skin tone, activates cells regeneration. Reduces inflammations, good for hair damaged by chemical colors and mechanical damage. Silver stimulates activity of cells, extends blood capillary, balances level of hormones, promotes removal of toxins and wastes from organisms. Due to this, the overall body tone is accelerating, and immune system strengthening. ** Many cosmetologists recommend to wash face daily with Silver colloidal, higher concentrations. *** Suggested that better to warm up Silver water and wash face gently, than let to dry skin naturally, without towels. Various topical/internal applications, bath water, toys, tools, clothing disinfection, as a rubdown, or warm fabric with strong Silver ,applications around bodies. are reported continuously and prove the uniqueness of truly powerful friend of us, “Saint” metal Silver. It is important to have Silver colloidal always at one home, and keep it in dark place at room temperature. *Note: It will not, though, kill bigger size bugs, flies or other insects, while destroying simple forms -streptococcus,staphylococcus. Silver helps to eliminate bad smell and disinfect areas. Perfectly and safely applicable to all pets and livestock animals. 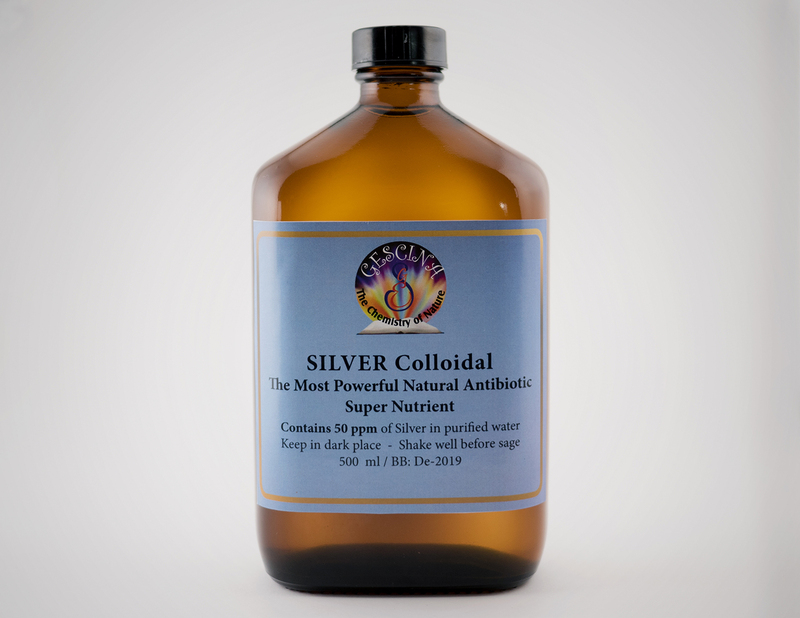 Suggested dosage/use: 1-3 tablespoons of Colloidal Silver per day between meals, or as recommended by naturopaths. Concentration and course depends from personal conditions. No dilution or blending is required. L.A. Kylskiy. SILVER water, Kiev, Ukraina,1987. http://greenmaster.biz.,Power of Silver water, Sophia,2008Dr. Harry Margraf, St. Louis, Missouri, Science Digest,1978. Dr. Charles Fox, Columbia University, 2011. Pets –Use as a disinfectant, antiseptic, antibiotic [ give orally, drop into ears, eyes, and much more]. Potted plants and garden plants/soil – spray on the leaves and soil. Acts as strong support for the plant and its roots. Fresh cut flowers stay longer in silvered air. Seeds/roots – spraying with 5-10 ppm of Silver helps to disinfect and increase yield, to improve maturity. It has been proven that the treatment of seeds and roots could increase harvest up to 15%, simultaneously protecting plants from a number of pathogenic microorganisms. Soaking vegetables – allows better preservation and pickling. Silver added to pickling into jars allows reduce amount of other preservatives, while keeps original taste and freshness of fruits and vegetables. Available concentrations: 20( $ Ca 28.0) ,50($ 34) , 150 ppm($46.0) , amber glass bottles, volume 500 ml. *** Allergy for Silver is extremely rare, but one may easily check it, before starting course with family doctors or experienced naturopaths.